For the first time since leaving Kirkenes the wind was directly behind me, and I couldn’t have been more thankful. If I’d been paddling north I wouldn’t be moving. Leaving Rørvik, I pedalled beneath a high, majestic bridge, a guilty pleasure I revel in when travelling on water. I adore the anonymity of passing beneath a train of traffic, nobody up there having a clue what strange craft is down below. The sea state was uncomfortable that day, waves crashing around but, crucially, into the back of my bike, propelling us forward. I sought refuge that night in a community roundhouse in a tiny village called Utvorda, delighting in the shelter that had been built by the local government years earlier for village concerts and summer drinking by the water. On that wet, dark night I was just grateful for cover. I spent that night in Bessaker, in a room above the local shop that the manager, Torhild, led me straight to after my arrival, but not before offering me a choice of the breads that the next day would pass their sell-by date. The next day, the MS Spitsbergen opened up their tender deck in the open water beyond Stokksund and again, with all the passengers up above waving flags and snapping photos, I was beckoned to approach. But this time I was invited on board, where a single table and chair had been set up on the tender deck. Tablecloth and ice bucket and all the dressings, and a medium-rare burger and a side of potatoes and salad served to my amazement. I must admit, it was quite awkward eating with the crew and passengers staring down, knowing that the ship was halting its schedule for me, but the kindness, execution of a bizarre idea and the audacity to support my trip this way sums up Hurtgiruten as company. They’re family. 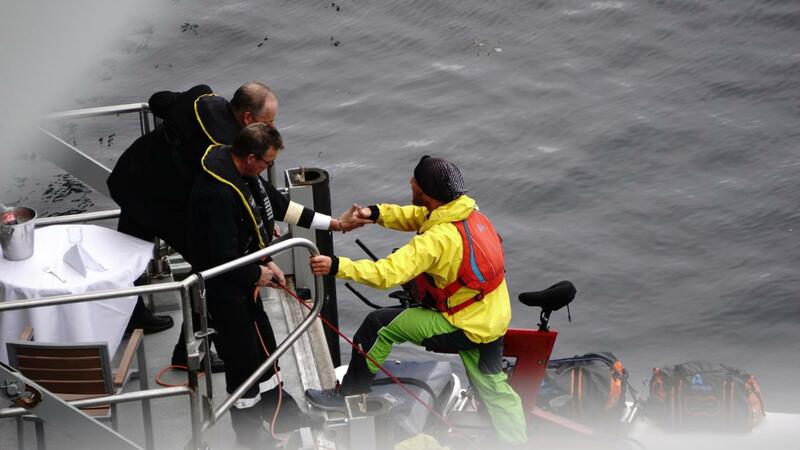 You simply wouldn’t get this service from a typical cruising company. 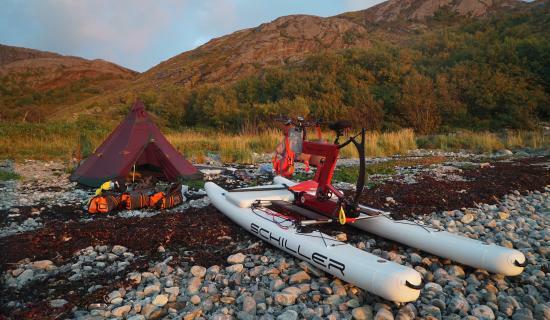 At Lesøysundet the owner of the local Brygge kindly offered me a room, and the next day I was delighted to reach my primary goal for this expedition, passing the 1000 mile mark and ticking off the 14th different non-motorised journey over 1000 miles of my life. It takes a lot of time, energy and support to reach that distance without a motor, and such has been the resolve needed to make this journey a success, I can safely say I’ve never been so grateful to reach the 1000 mile mark - for so long it had seemed an unbridgeable distance away. The Norwegian coast can be as brutal as it is beautiful. Later that day I got another treat, my fiancé Emma and good friend Andy were waiting on shore having driven from England to support my last two weeks, and they’d be there for each of the remaining nights whatever the weather. The weather treated us kindly as I rounded Stadt, a peninsula famed for its rough waters, and then, on the final straight south to Bergen, I passed the remaining Hurtigruten ports, Måløy and Florø, names that had justifiably felt a great distance away when I started this journey two months earlier in Kirkenes. 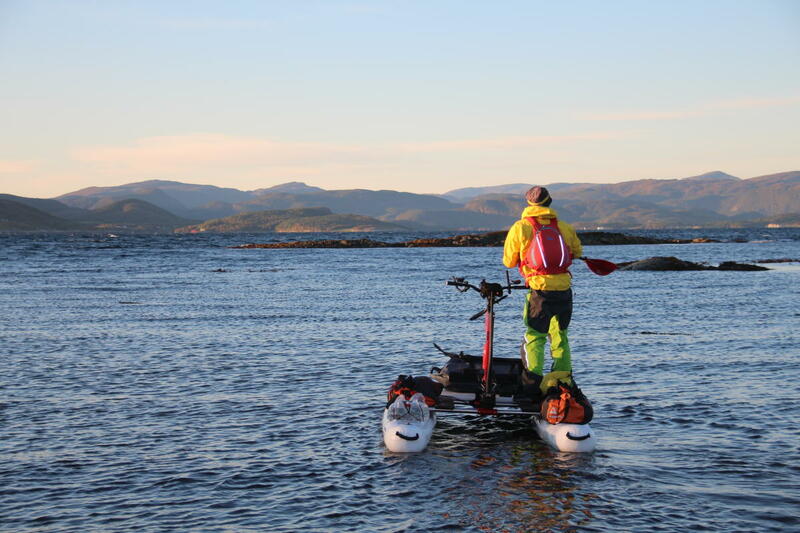 Originally, I’d imagined that this journey would take six weeks and as I left a small marina on the west side of Florø the ninth week of the trip began. I had less than a week to go before further commitments back home began, and the tail end of the hurricanes that had left a trail of destruction across the Atlantic were now feeding into weather patterns in the eastern Atlantic. The forecast didn’t look great for the coming days and I decided on a dash south from Florø into hopefully calmer waters. Two hours later I realised I’d made a mistake as winds gusted up above 35 knots and hungry waves removed bags from my bike’s pontoons. Thankfully I retired behind a sea wall on the island of Askrova. For an hour I’d battled conditions that threatened to finish me off and I promised myself that given the same situation again, I’d opt to stay on land. I’ve been travelling under my own steam for over a decade and the joy of youthful freedom has evolved into life where adventure is still important, but not as important as life with a loving fiancé. Typically, under the shelter of a roof kindly offered by a local, I spent two days weighing up the increasingly poor weather against the importance of finishing what I’d started, and eventually I opted to stay safe, to call the journey 80 miles north of Bergen. Norway is a country famed for its wild beauty, but all too often that rugged country can be taken for granted. Mobile phones don’t work everywhere. Weather can change in an instant. As important as it is to experience wide open landscapes and push our boundaries, there is no point risking our lives for the sake of reaching a goal. I chose to take on this journey for the same reason behind the other 1000+ mile expeditions I’ve enjoyed so far - to be alive. And so, with a little tickle of relief in my belly, it seemed fitting to cover those last miles between Askrova and Bergen with my best friends and the biggest supporters of this incredible journey down the Norwegian coast; Hurtigruten. Several weeks earlier the MS Polarys has arrived into Kirkenes with my Schiller Bike on board, and here we were, riding the ship south through raging winds and angry waters. 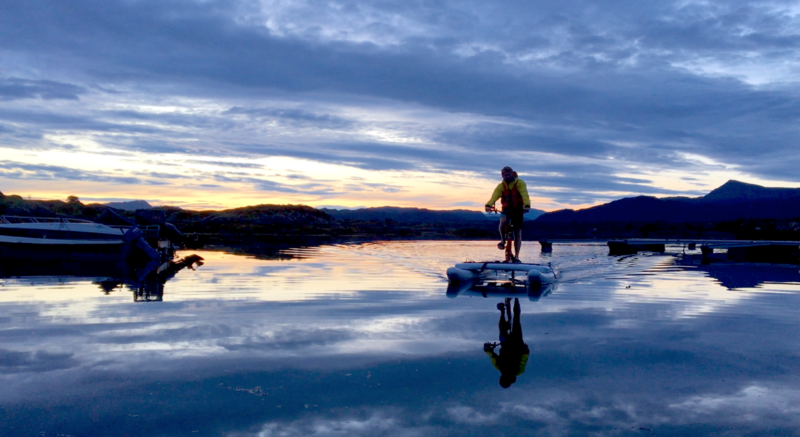 Not one thing I saw from the decks made me want to be back out there on the water and although the journey had ended prematurely, the memories I’d gathered since leaving Kirkenes will stay with me for a lifetime. See background information about this trip. Also read Dave&apos;s other blog posts.